This post is from 2017. For this year's Halloween events, please check out the 2018 Sioux City Halloween post! 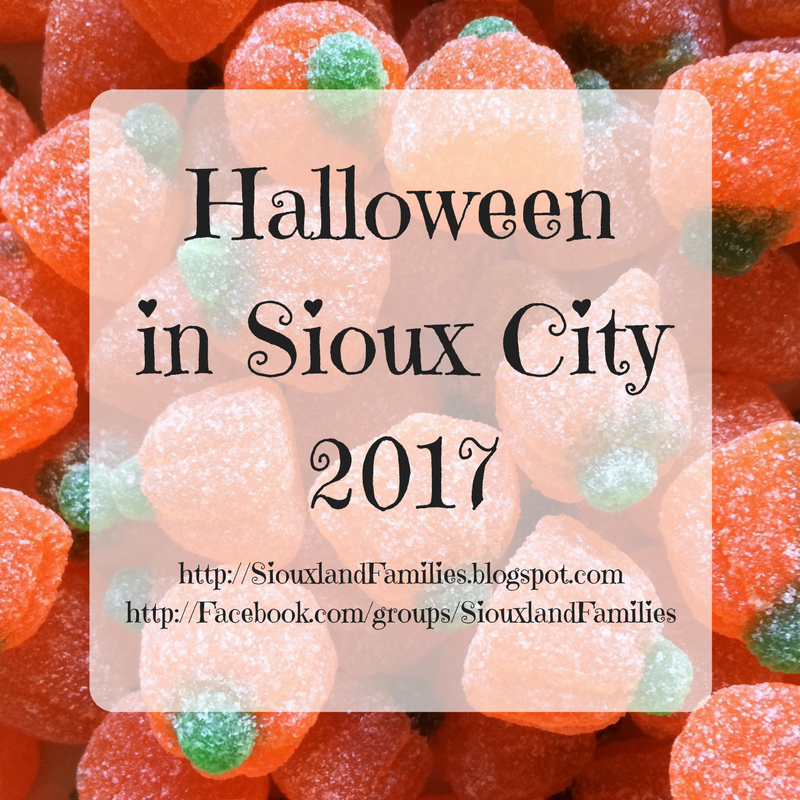 Halloween this year is on a Tuesday (October 31st), and there is no ordinance setting trick-or-treat hours for neighborhoods in Dakota Dunes, North Sioux City, Sergeant Bluff, Sioux City, or South Sioux City, but traditionally it is recommended kids go between 6 and 8pm. Sun 10/15 2-4pm: Military Family Trunk-or-Treat event for current or retired members of the Iowa air/army guard/reserve only. Military ID required and relatives without military ID must be accompanied. More info on Facebook. Sat 10/21 1-3pm: Trick-or-Treating and Halloween activities at Hy-Vee on Hamilton Blvd. Sat 10/21 2-4pm: Halloween Spooktacular at Long Lines Rec Center featuring bounce houses,face painting, rock wall climbing, and much more. Organized by the Sioux City Parks & Rec Department and Norm Waitt Sr. YMCA. Sat 10/28 noon-4pm: Halloween Comic Fest at Acme Comics: kids are encouraged to come in costume to trick-or-treat for a free comic! Tues 10/31, 6-8pm: Mall-o-Ween at Southern Hills Mall for kids 12 & under accompanied by a parent or guardian. No masks allowed. Tues 10/31 6pm: Trunk or Treat in Leeds by Dental Depot on Floyd Blvd. If you have kids in school, be sure to check with the PTO about whether their are any events exclusively for families of kids at your school. If you're looking for a pumpkin patch to visit this October check here. You put a lot of time into rounding up all the activities! It's appreciated!